Gift-giving season is right around the corner! Can you believe it? I don’t know about you, but it stresses me out. I’m terrible at giving gifts because I don’t know what people want or need. That’s why my favorite gifts are cute, silly, and unexpected! As a stationery enthusiast, I know that it can be hard to buy stuff for a journal addict. There are so many brands and varieties – how are you supposed to navigate that? You don’t need to! Get your paper-loving friend something that will brighten their desk, pencil bag, or bookshelf with one of these whimsical stationery gifts. These silly presents are guaranteed to make the pen hoarder in your life smile! This is one of those gifts that you don’t know you need until you unwrap it. Who hasn’t always wanted to send a fancy letter with a proper wax seal? It’s straight out of Harry Potter or Game of Thrones! These adorable little cards are perfect for the loved one who is truly a woodland creature at heart. Okay, if someone could get this for me, I’d be so happy. Nothing makes the heart sing quite as much as a well styled bookshelf, and these bookends take the cake! Oh, and did I mention that you can get them in lots of different colors? Yes please! This is for the shower philosopher in your life. This whiteboard allows you to jot down any sudden insights or brilliant ideas while scrubbing yourself squeaky clean. Neat! Grab this notepad for the student in your life. Trust me, they’ll think it’s hilarious. These bone pens are a great silly gift to add some laughs to your loved one’s desk! These are especially great for vet, med, psych, and biology professionals or students. Bonus: no one will ever steal these pens! What better way to show your quirky side than to hold your pens in this adorable robot body pen container? This may be turning into a list of things that I want…. I mean, how could I say no to a fox mug? All stationery addicts run on coffee and/or tea, so a cute mug will never lead you astray. This is a universal gift that will always work! If you yourself are a prankster or you know one, then this is a perfect gift! These shocking pens are a classic trick for your resident troublemaker. This floating bucket is perhaps one of the most whimsical stationery gifts on this list! It’s cheeky and cute, perfect for anyone’s unique desktop environment. I can 100% see this on my favorite high school teacher’s desk. There’s nothing like a tongue-and-cheek notepad to make a work environment a little bit funnier. Grab a self-therapy notepad to work through your issues and determine that it’s probably your boss’s fault anyway. And if self-therapy ain’t for you, check out Knock Knock’s countless other novelty notepads! Awaken your inner child (or give this to an actual child)! These LEGO gel pens are perfect for the builder in your life! You can connect LEGO bricks to these pens, minifigures, or any other design that suits you. This is truly a perfect whimsical stationery item! Of course, you can always grab stickers from Coffee Fox Creations to give to your stationery-loving relatives. There’s surely something there that a paper obsessed person might enjoy! Make sure to check out my gift guides page for more inspiration! Christmas should be a time of love, family, and laughter. So don’t worry if you aren’t giving a ton of super expensive electronics or ultra-stylish clothes. Sometimes a little bit of silliness can help to really bring a holiday season together. My favorite gift from last Christmas probably cost only about five bucks, but it made the entire family laugh like crazy! 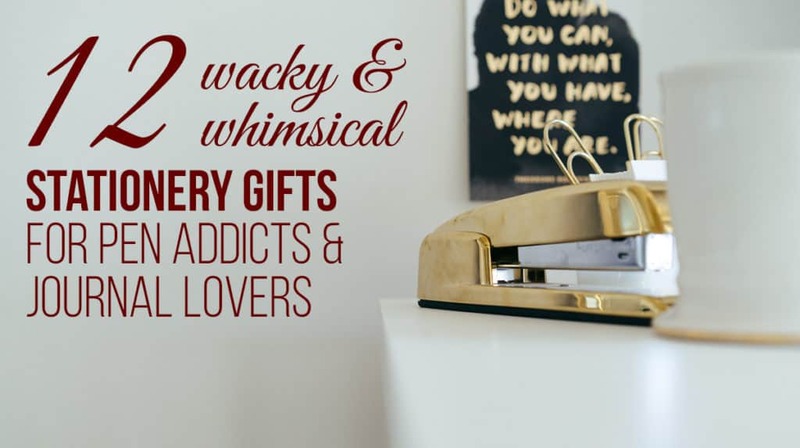 This year, give the unique, quirky, and whimsical stationery gifts that will entertain and delight your friends and family. Or grab some of these for yourself 😉 I’ll never tell!